Two years ago, I wrote about the uncertainty surrounding the future of the Connaught Centre on Connaught Road in Hove. The building’s owners, City College, were looking to consolidate their property portfolio which may well have led to the Connaught’s sale and demolition. If Ninka Willcock and her Brighton Society colleagues and contacts hadn’t stepped in to campaign for listing then perhaps the site would now be home to a Tesco petrol station. 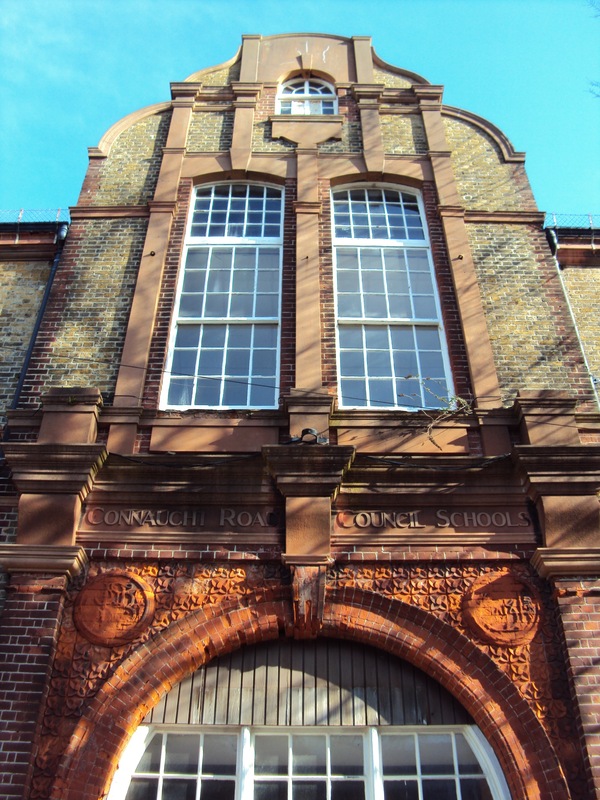 The Connaught Centre began as Connaught Road School and opened in 1884. Separate entrances existed for teachers, junior boys, junior girls and mixed infants. It was built by John T. Chappell and designed by Thomas Simpson at a total cost of £12,180. A pleasing mixture of red bricks, yellow bricks and terracotta leaves us in no doubt that Simpson went above and beyond the call of duty. Grand gables, huge windows and no gap between facade and pavement stamp the building’s authority on its surroundings. 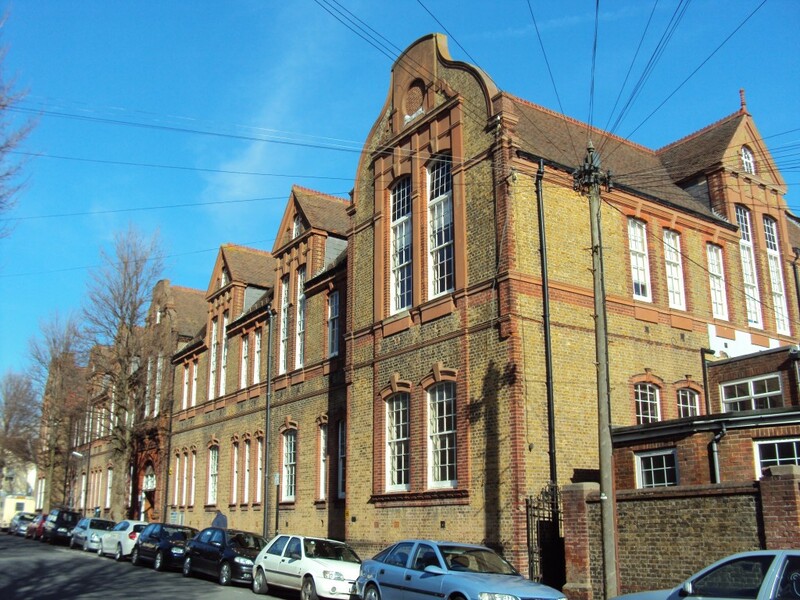 Simpson was also responsible for Finsbury Road School, Downs Junior School and St. Luke’s School in Brighton but the Connaught is his only surviving building in Hove. It is an excellent example of a Queen Anne-style school and is generally well preserved internally and externally. These features strengthened the case for listing. The Secretary of State for Culture, Media & Sport is responsible for listing buildings of ‘special architectural or historic interest’ and is advised by English Heritage and other organisations when assessing applications. Around half a million buildings feature in the register which is published by the Secretary of State’s Department. A register of local listed buildings is kept by Brighton & Hove City Council though. The Connaught Centre was awarded Grade II Listed status last year – its 125th birthday in fact! A listed building should not be demolished, extended or altered without special permission but this level of protection mustn’t be taken for granted. Listed buildings do vanish. Indeed, look at the Grade I Listed West Pier. A number of events, displays and competitions are being held at the Connaught Centre on Saturday 20th March to celebrate the building’s 125th year. Research on the building is still being undertaken and members of the public are being encouraged to bring along any interesting documents or photographs. For details on the celebrations, see www.connaughtcentre125.blogspot.com or call 01273 667744. The Victorian School Experience’ for ‘children of all ages’ certainly does sound like fun.